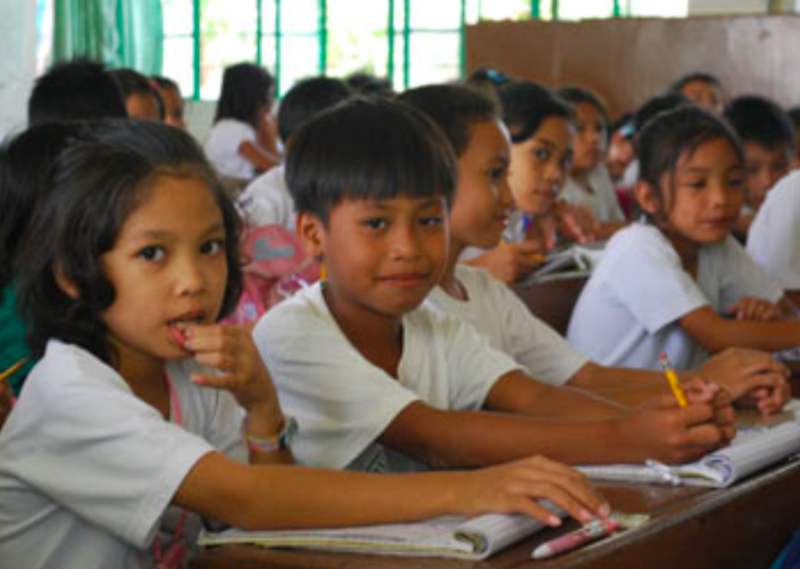 Filipino school children. File photo courtesy of Unicef. Primary schools could become the latest front line in President Duterte’s controversial war against illegal drugs. It has been announced today (Friday, June 22) that bags and lockers could be inspected and teachers randomly tested for drug use. Law enforcement agencies have proposed random drug testing of teachers as well as on 10-year-old fourth grade pupils. The education department has opposed the plans. Catalino Cuy, the head of the Dangerous Drugs Board (DDB), said his office would study the proposals. “Drug prevention programmes in schools are already in place. These have proven to be effective in deterring drug use and instilling the importance of leading a healthy and drug-free lifestyle among students,” he said. Consultations with schools, parents and other members of the DDB board, which included the education ministry, will be done to ensure rights of students are protected and their safety is guaranteed, said DDB public relations officer Ella Marie Dimaculangan. The education department said it opposed the drug enforcement agency’s plan to have 14 million primary school students from fourth to sixth grade undergo drug testing, saying it was against the law. “The Department of Education observed that the proposal of the Philippine Drug Enforcement Administration (PDEA) to test all students age 10 and older may require the amendment of the Comprehensive Dangerous Drugs Act of 2002, which authorises drug testing for secondary and tertiary level students only,” it said in a statement. Education Secretary Leoner Briones is now seeking a meeting with the head of the PDEA to discuss the proposals. PDEA spokesman Derrick Carreon said the agency had already proposed amending rules to make drug testing mandatory for all high school and university students, as well as teachers. He said they also wanted random testing for grade school students aged from 10 to 12 after some children had been “rescued” from drug dens by police. Has not worked in any other country in the world, ever. Good luck with that Philippines. Duterte, like every fascist, needs a “bad-guy” to rally the people to his side to fight the enemy. Hitler, for example, convinced Germany that Jews were evil. The Philippines’ drug problem is no worse than most other countries. The percentage of drug use here is exactly the same as in the UK. You don’t see thousands of poor suspects being gunned down in the UK. You don’t see dozens of calls for violence against drug suspects from their prime minister. And you don’t see this kind of disruption of schools in the UK. The Philippines’ education system is bad enough without this kind of thug intrusion. But Duterte needs a bad-guy to distract the people from his disastrous policies.